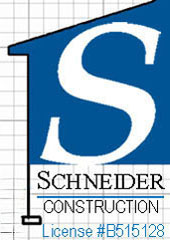 Schneider Construction, Inc. | Drainage Specialist | Foundation Repairs | Foundation Retrofits | Serving Los Angeles and adjacent areas. •	We offer complete residential remodeling and/or property rehab service. comfort or prepare for market or prior to move in. home owners to rehab, market and sell their properties. •	WE BUY PROPERTIES REGARDLESS OF CONDITION. This inspection is followed up with a written report/proposal emailed to you with a line-item list of the work we recommend. -We also provide all of the labor and materials to complete all of the work we propose. • Foundation repair and/or replacement including settlement issues. • Foundation crack repairs. • Concrete slab repairs. • Floor leveling. • Any and all repairs in the crawl-space area. •	Termite Report repair work including structural framing repairs. We provide site inspections including the crawl-space areas under your house to identify foundation issues including adherence to the Los Angeles Department of Building and Safety earthquake hazard reduction recommendations. earthquake hazard reduction recommendations – EARTHQUAKE RETROFIT. •	Earthquake Retrofits to include foundation bolting and cripple wall repair and strengthening. We provide site inspections including the crawl-space areas under your house to identify drainage issues and offer you our best advice for solution. • Corrective grading in landscaping areas and yards to control water runoff. • Installation of foundation waterproofing. rain water catch basins, rain gutters and rain gutter downspout connectors. • Installation of 4" drain pipe to connect all of the above listed drains to the street. OUR SERVICE AREA INCLUDES ALL OF LOS ANGELES COUNTY AND ADJACENT AREAS.